Find a boxing class near you. Rock Steady Boxing improves the quality of life for people battling Parkinson’s disease through non-contact, boxing-inspired fitness training. No boxing experience is necessary. Participants must be able to safely stand for 20 minute intervals. This class is taught by coach Todd “Lucky Punch” Paris. 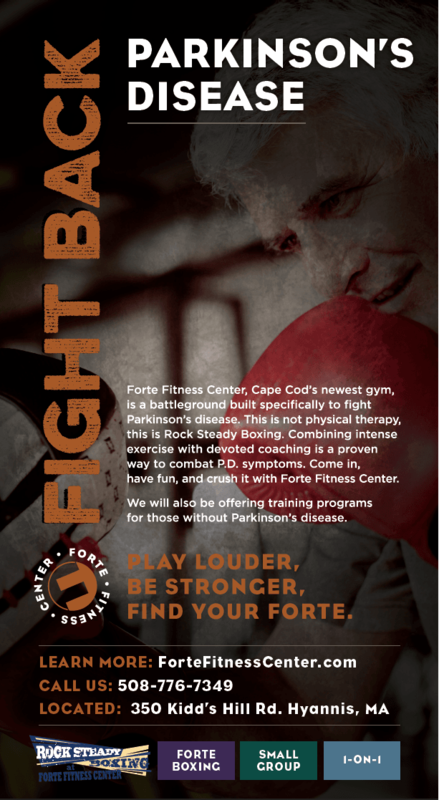 Rock Steady Boxing is a non-contact, boxing-inspired fitness class designed for individuals with Parkinson’s. No boxing experience is necessary to participate in this class. This RSB session is taught by coach Al Latulippe. Rock Steady Boxing improves the quality of life for people battling Parkinson’s disease through non-contact, boxing-inspired fitness training. 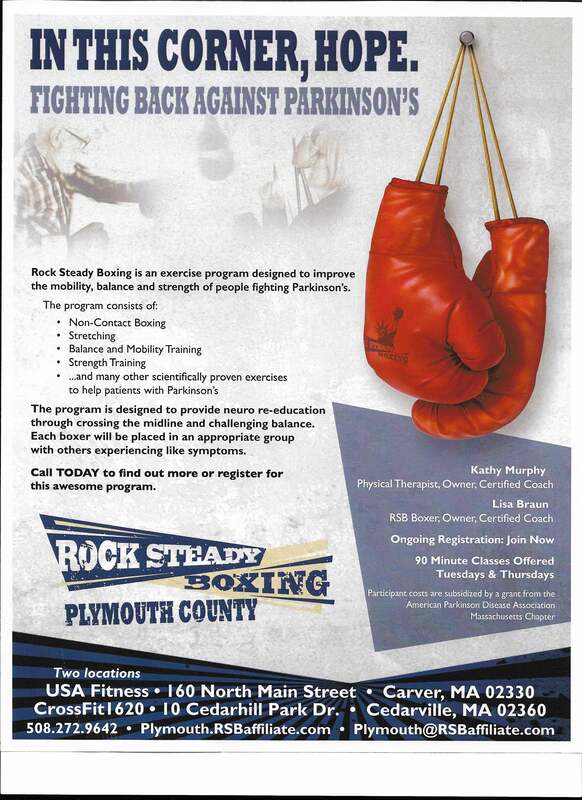 Rock Steady Boxing Plymouth County is excited to offer 2 certified coaches in each class, one who is a Physical Therapist.  We will work every day to help people with Parkinson’s disease enhance their daily quality of life and even build impressive power, strength, flexibility and speed. Each class will be different so there’s never a dull moment! We will include Pilates exercises for core strength and Dance exercises for balance. Working together to fight Parkinson’s builds the body and mind as well as wonderful friendships! Join the fun and enrich your life!  The cost of the class is subsidized by a grant from the APDA Massachusetts. Rock Steady Boxing improves the quality of life for people battling Parkinson’s disease through non-contact, boxing-inspired fitness training. No boxing experience is necessary and people of all ages are invited to participate. This Rock Steady Boxing class is taught by licensed Physical Therapist Linda Holland. Rock Steady Boxing improves the quality of life for people battling Parkinson’s disease through non-contact, boxing-inspired fitness training. No boxing experience is necessary and people of all ages are invited to participate. The program is run by head coaches Al Latulippe and Greg Geheb. Click here to see the program flyer or visit Rock Steady online here. Rock Steady Boxing improves the quality of life for people battling Parkinson’s disease through non-contact, boxing-inspired fitness training. No boxing experience is necessary and people of all ages are invited to participate. Please contact Dena Paolino for class information and session times. Rock Steady Boxing Dover improves the quality of life for people battling Parkinson’s Disease through non-contact, boxing-inspired fitness training. No boxing experience is necessary and people of all ages are invited to participate. The program is run by certified coaches Cheryl Marconi and Max Marcoux. For more information about Rock Steady Boxing Dover, click here. Rock Steady Boxing improves the quality of life for people battling Parkinson’s disease through non-contact, boxing-inspired fitness training. No boxing experience is necessary.  Classes are available for individuals at any level of Parkinson’s disease and any level of fitness. Days & Times: Rock Steady Boxing classes are offered Monday through Friday, multiple times each day. Contact the gym for more information. Rock Steady Boxing improves the quality of life for people battling Parkinson’s disease through non-contact, boxing-inspired fitness training. No boxing experience is necessary and people of all ages are invited to participate. This class is taught by RSB certified instructor Melissa Campbell. Instructor Kim Crowley’s exercise and boxing instruction enables simultaneous work on gross motor movement, rhythm, core strength, balance, and hand-eye coordination. This class is a non-contact boxing-style conditioning class. Rock Steady Boxing improves the quality of life for people battling Parkinson’s disease through non-contact, boxing-inspired fitness training. No boxing experience is necessary and people of all ages are invited to participate. This Rock Steady Boxing class is taught by certified personal trainer Al Latulippe. Rock Steady Boxing improves the quality of life for people battling Parkinson’s disease through non-contact, boxing-inspired fitness training. No boxing experience is necessary and people of all ages are invited to participate. This class is taught by licensed physical therapist Christine Awdycki. Rock Steady Boxing improves the quality of life for people battling Parkinson’s disease through non-contact, boxing-inspired fitness training. No boxing experience is necessary and people of all ages are invited to participate. The program is run by head coaches Rich Gingras and Michael Quaglia. Rock Steady Boxing improves the quality of life for people battling Parkinson’s disease through non-contact, boxing-inspired fitness training. No boxing experience is necessary and people of all ages are invited to participate. Participants must be able to safely stand for 20 minute intervals. The program is run by head coach Al Latulippe and supported with a grant from the American Parkinson Disease Association Massachusetts Chapter. To visit the Rock Steady Boxing Boston website, please click here. Rock Steady Boxing improves the quality of life for people battling Parkinson’s disease through non-contact, boxing-inspired fitness training. No boxing experience is necessary. Participants must be able to safely stand for 20 minute intervals. This is a Spaulding Rehabilitation Hospital Cape Cod class for people with Parkinson’s. Classes meet twice weekly for six weeks at a boxing gym on the Cape. Spaulding therapists certified in RSB lead the 90-minute sessions. In addition to functional improvement, RSB participants appreciate the camaraderie of striving with peers and the motivating power of therapists who are passionate about the program. No boxing experience is necessary for this program, and people of all ages are invited to participate. The program is run by Chad Moir, a Parkinson’s fitness expert. Rock Steady Boxing improves the quality of life for people battling Parkinson’s disease through non-contact, boxing-inspired fitness training. No boxing experience is necessary. Participants must be able to safely stand for 20 minute intervals. This class is taught by Kim Gada from National Physical Therapy.  For more information on National Physical Therapy, click here. DopaFit provides boxing classes in Worcester, MA. Contact Chad Moir for more information.